"Introduced at MACNA, the Reef Illuminations fixtures created quite a buzz, in part because of the unique LED supplemental lighting system. We received so many inquires on the LunarLites that we have decided to make them available as a retrofit product. The LunarLite LED tubes have the same look of a standard T5 tube, but they are powered by a low voltage transformer, not a fluorescent ballast. The T5 form provides better spread of the light over the entire aquarium. Encasing the LED's inside a T5-style tube protects them and their circuit boards from the harsh, salty, humid environment that is your normal saltwater aquarium. The IceCap LunarLites have an aluminum heat sink on the back side of the tube to dissipate what little heat they generate. LunarLites are highly efficient and very reliable but we know the reason you'll want them is what they will do to the appearance of the corals. They are designed to excite the green fluorescing proteins in corals. They particularly bring out yellows, oranges, and greens. If you think your corals look good under actinics, you haven't seen anything yet! Mushrooms, zoanthids, Ricordea, and most any fleshly large polyp stony corals look amazing under the LED's. The LunarLite retrofits ship with mounting clips to secure the LED Tubes to a canopy, commercial hood or existing fixture. The weight should not be an issue because the 2-foot unit is only 4 oz. Power connection to the LunarLite is a power tail with a quick connect to a low voltage power supply, no hand wiring required." We can't wait to try out these new LED retrofits, the colors produced by LEDs are truly amazing. The shimmer effect will be a nice addition to flourescent powered tanks, as many detractors claim normal T5 light looks like "garbage" without the shimmer of a halide, despite the insane colors many corals attain. Here's a Photo I snapped of some Ricordea using Hydor's Blue LED Spotlight. Anyone who has happened to read my Hot Nano Fish Series in Reef Hobbyist Magazine should be able to tell that I have an obsession for the small. It seems my progression in the hobby as taken me from the Macro to the Micro. I have found in my experience that large, aggressive fish like tangs can spoil the tranquility of a reef tank, and are certainly not suitable for smaller reef systems. However, these tiny little creatures are very hard to catch in the wild, so aquaculture is the only avenue for sustainable collection and trade in some of these species. ORA continues to lead the aquaculture industry, and they announced last month that they have been working on approximately 12-16 new species of fish would could enter the market next year, 2010. 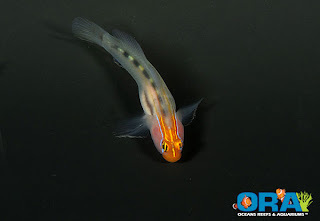 Most of the fish they are currently working on are gobies, and of course dottybacks and clownfish, including some anticipated new "Designer" morphs. The first ones to hit the line up have been announced, and should be filtering to stores in the first weeks of December. 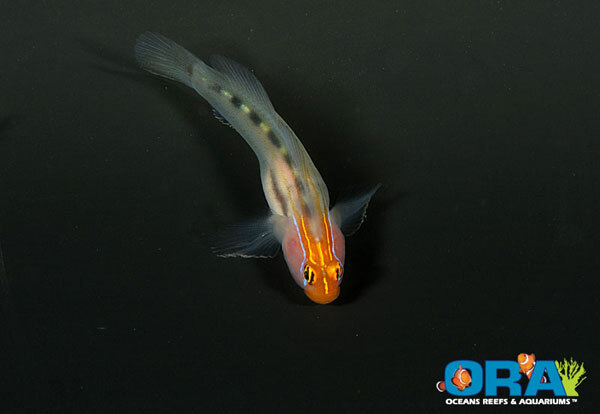 ORA Re-released the popular Red Head Nano Goby, which doesn't get much larger than 1 -2 inches. Making them perfect for many nano and pico tanks. Another smaller fish perfect for nano tanks is the Elongate Dottyback. 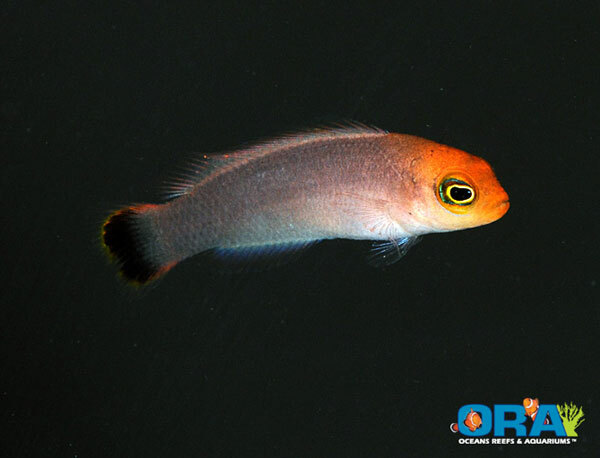 This is one of the smallest members of the dottyback family, offering a unique addition to any tank. ORA is also offering Grade B Snowflake Clowns, with some unique markings, alongside the rest of their great lineup, including their new smaller sizes. Sunlight Supply, one of the largest lighting manufacturers and distributors in the Saltwater industry, sent out e-mails today to customers announcing a new sixty-inch Tek Light fixture. This is great news as there has been a lack of lights to fit this odd ball length. The Tek line of T5HO fixtures remain strong competitors in the T5 lighting game. While other companies such as Current have been faltering, Sunlight is continuing to expand product lines and give consumers what they're looking for. Tek light fixtures are very sleek, 2 and half inch thick light fixtures that come in 2, 4,6, and 8 lamp configurations. They can be mounted on adjustable legs or suspended. Suspension seems to the most popular way to place these lightweight light fixtures over a tank, and gives a very modern look when exposed, especially on Euro style or Rimless tanks. T5 have become very popular within the Hobby because of there uniform light distribution, cool operating temps, low energy consumption, and relatively affordable replacement bulbs. 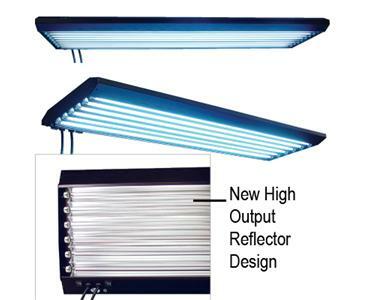 The New 60 inch fixture will accept 80 watt bulbs from a variety of manufacturers, such as popular D-D Giesseman, Korallen-Zuct, and Blue Life SPS. The Mystic Reef is now taking preorders for this light, so let us know if your interested in one of these lights. Hydor Continues to Perfect Their Market Niche. Hydor. If you havn't heard of them, either you live under a rock, or you've never seen the need to replace your Tunze Streams. Hydor is a well known aquarium product maunufacturer from Italy, though when most reefers think of them, they think of the egg shaped Koralia powerheads with magnet attachments, and with good reason. 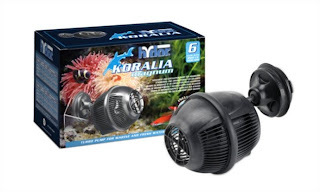 The Hydor Koralia is another take on the popular Propeller-style pump, like the Vortech or Tunze streams, which deliver powerful yet broad water flow with little head pressure. This makes them very ideal for Reef tanks requiring massive turbulent water flow. Normal output pumps produce more of a thin column or jet of fast moving water that is not very efficient at creating the random flow needed for a reef tank. The flow normal pumps produce is a constant laminar flow, which is completely unnatural for most corals and can actually cause certain corals, like Euphyllia , to recede from their skeletons if placed in direct flow. Anyway, propeller-style pumps have revolutionized the aquarium industry, and it's nice to see the innovations havn't stopped. A Hydor Sales rep came in to let me know what's been going on with the company. 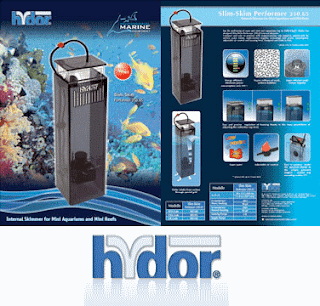 Besides their Aerio pumps being in CPR's new line of protein skimmers, Hydor will be coming out with their own Nano Skimmer, the "Slim Skim" designed to fit most "Nano" systems. They have also announced the release of the "Marine Performer" skimmer for larger systems. They also will be advancing their next generation of powerheads by introducing "shaftless" impeller designs. This is said to cut out the rattle on start up of these pumps, with the benefit of being able to connect the baseline Koralia to wavemaking devices. The former pumps would fail to start, rattle, or worse, reverse flow when connected to a wave timer, causing your pump to become a fish blender unless fitted with the protective screen. Hydor as already released a line of Controllable Koralias to be used with their dual or quad controller. Performance is very good with intuitive conrtols, however it may not have been the correct market to introduce a rather expensive controller. The world of higher-end reef equipment is highly competetive and companies like Tunze and Ecotech have carved strong market shares out with their respective products, and there must be innovation to compete. Koralia powerheads are about as good as any other prop pump, but their incompatibility with other controllers has kept many reefers from incorporating them into their systems. Hydor has proven they can adapt with the times. Their powerheads have proven to be a best buy for water movement. I was also given one of their blue LED spotlights, its similar to a moonlight, but also available in red or green. The spotlight produces some very dramatic effects in the corals. ORA (Oceans, Reefs, and Aquariums) have long been the industry standard in tank reared livestock, most notably for their great variety of Tank Raised Clownfish, including the infamous Picasso Clownfish. They also have gained a cult following with their collectible corals (with websites and facebook pages devoted just to photos of the various corals.) But nevertheless, there is a rightfult reason the common clownfish graces their logo, they produce thousands of them. Not just that, their T.R. clowns come in at sizes comparable to wild clowns. Its extrordinary to consider how much longer it takes to grow fish to this size for market, compared to what the rest of the industry offers as "tank raised." Every other dealer I've visited or bought fish from, usually will have Tank Raised clowns available. Mortality rates with wild clowns, especially Perculas, is atrocious when not handled correctly, which is why just about all of clowns we buy are captive bred, unless they are some desirable specimen I must have. I hesitantly purchased some juvenile perculas from a dealer recently. However the only reason I did was because they were gorgeous, nearly all black individuals, and I happen to trust this dealer's system and husbandry practices very much. They all did great and now I have some great near-onyx pairs. Breeding fish on a commercial scale is a lot different than doing it on a hobby or experimental level. The bottom line is the "Bottom Line," and no matter how attractive, rare, or interesting, whatever you've bred, must be salable. Often times months to years of work go into raising these fish for market, and a lot of expenses and resources become consumed as these fish take up space growing. This fact keeps many breeders selling their fish small for a faster turnaround. ORA has always impressed when it comes to sizing, normally we are happy we get them so large, however, there are a few customers that see these tiny clowns available at other stores and want some for themselves. So, we let ORA know we have been looking for smaller clowns to accomodate our Nano customers, and they must have gotten that request a lot, because sure enough small size clownfish are now available on their pricelist. In another interesting tale of the tiny, we have been looking for some unique fish to display in our store, and we let our friends at ORA know. They know we have an affinity for the unique, how we keep all of the interesting color morphs and "stubby" clownfish we come across, adding to our ever growing clownfish collection. Well we were able to get some very special clowns and give them a new home at the Mystic Reef. We received a pair of TINY (1/2 inch) clowns. Not just ordinary clownfish, one is a Platinum Percula and the other a Snowflake Ocellaris, making them quite the odd couple. Making them even more special, they are believed to be "dwarves" or runts. They were housed in the same growout tanks and are the same age as the other Platinum or Snowflakes, except they are about 1/4 the length. The fish appear to be mature, with dark edges on the fins and surrounding the bars, but their size disagrees. ORA has produced "Stubby" clowns for a while now, but that appears to be another type of variation/ mutation which compresses the spine, which could be likened to extreme scoliosis. There is a fine line of ethics when breeding any creatures. I would like to see how many "designer fish" haters who claim all of these "mutants" should be culled, own other pets like dogs. After all, the great variation we find in various dog breeds stems from traits we bred into them. Isn't a yorkie nothing more than a "Mutant Canine"
Ecotech Announces It will soon be compatible with third-party Equipment! Vortech MP40 On a Store Display. "November 13, 2009—Lehigh Valley, PA— EcoTech Marine, the company that revolutionized the reef aquarium propeller pump, has announced the release of a development kit for third-party aquarium controller companies for its award-winning VorTech line. Although no firm release date has been established by manufacturers, stay tuned for announcements as controller companies begin to bring this desired technology to market. In addition to offering customizable controllability of the VorTech remotely through your controller, EcoTech customers will be able to download firmware updates and be remotely updated as to the operating conditions of the VorTech. The vast benefits of the controller are emerging as companies take interest and start working with the development kit. EcoTech's development kit is now available to the industry's leading controller companies and together we are making the necessary arrangements to bring controller interfaces to production. “We have heard our customers' request and worked diligently to bring a solution that will maintain the same level of quality and technological superiority that you have come to expect from us,” said Marks. The patented VorTech technology produces unmatched broad yet gentle flow while placing the motor outside the tank—preserving the beauty of the aquarium and enhancing the health of the tank’s ecosystem. With all the electrical components outside the aquarium and a variety of easy-to-program modes, the VorTech is the safest, most versatile pump on the market. " This exciting news is definitely a sign of the progress in the industry. Hopefully these advances will be able to couple the Vortech's already stellar performance with more universal controllers, but only time will tell. No news as to which companies are taking advantage of the kit, but we can expect companies like Neptune Systems and Digital Aquatics, who manufacture many aquarium controllers popular today .We will continue to keep you posted on advances in the future.